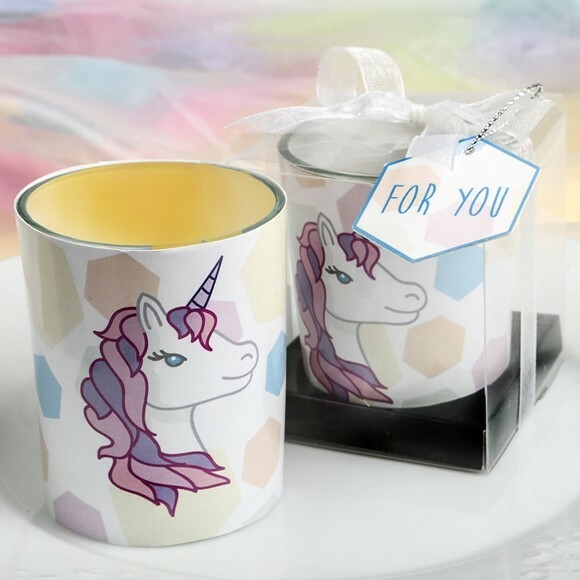 These wrapped glass votive candle holders feature a unicorn design with soft pastel accents against a white background. A white tea light candle is included in the glass votive. The candle comes packaged in a lovely gift-box with a black stage wrapped with a white organza ribbon and bow. Attached to the ribbon by a silver metallic tag is a 'For You' tag that matches the soft pastel colors on the votive. This on-trend Unicorn design votive is perfect for fantasy-themed events. Sold individually.